We are an energetic group with a passion to provide the highest level of medical and surgical care for your beloved pets. We look forward to the opportunity to meet you and your furry friends. We hope you will take a moment to get to know our team individually as you read our biographies below. 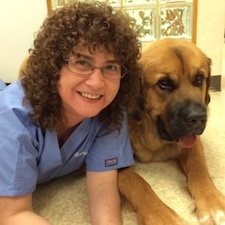 LuAnn has been a receptionist for the Animal Medical Center since 1997. 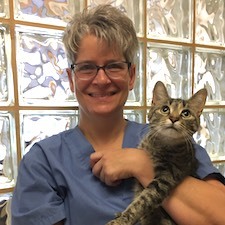 Prior to moving to the Traverse City area, she worked as a receptionist in the Saginaw area at the Sheets Veterinary Clinic for four years and Bridgeport Veterinary Clinic for seven years. 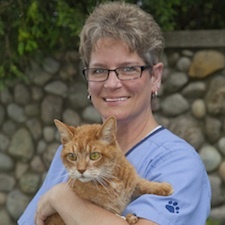 With over twenty-five years of devotion to the veterinary profession, LuAnn is still going strong. 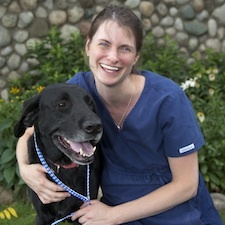 She has fulfilled her lifelong dream to serve clients and their pets in need. LuAnn and her husband, Scott, share their home with their German Shepard. Outside of work she enjoys reading, watching movies, bowling, and is a loyal Detroit Tigers baseball fan. 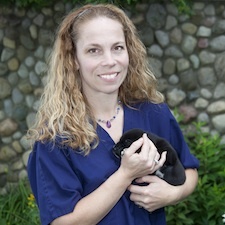 Kelli has been a Veterinary Technical Assistant of the Animal Medical Center since 2003. Most of her time is spent working in our laboratory running the necessary presurgical and medical tests on our patients. Kelli also assists the doctors in radiology, running laboratory tests, surgery, and dental procedures. She was born in Lansing and raised in Suttons Bay. She now lives with her husband, Mike, and their two children. Their family also includes three dogs and a cat. Kelli loves spending time with her children and enjoys going to all of their school activities. She spends her free time baking, gardening, and camping any chance she can get! Meet Liz! One of our newest staff members at the Animal Medical Center. Liz is a native of Traverse City. As a young girl, she enjoyed visiting the zoo and had decided at an early age to pursue a career in veterinary medicine. Liz has recently completed training to become a Licensed Veterinary Technician at Baker College in Cadillac and is excited to join our team. She shares her home with her 2 AC PAW kitties, Gracie and Bubbs. 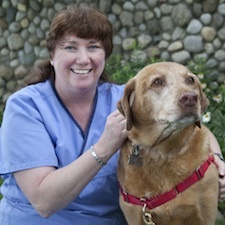 Marsha is a licensed veterinary technician offering over 20 years of loving, nursing care for our four-legged friends. Marsha’s parents were born and raised in Leelanau County. Earlier this spring she moved “home” to Suttons Bay after having spent many years as a LVT in southern Michigan. We are fortunate to have her tender hand and years of experience in surgery and patient medical care. On Marsha’s days off she spends time fishing and tending to her apple trees with her AC PAW kitten, Anabell. 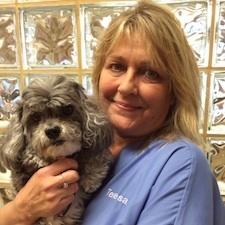 Teresa is our office manager at the Animal Medical Center. Her role of problem-solving, managing inventory, and attending to staff’s needs is crucial in keeping everything in working order around the clinic. 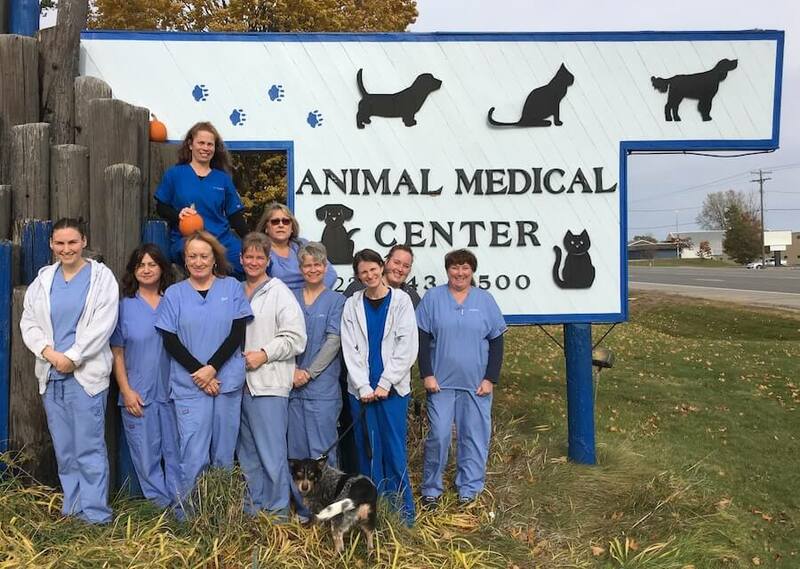 Teresa grew up in Lake Ann and moved to Florida after high school where she worked at Coral Veterinary Clinic for many years before moving back to Traverse City. From an early age, she has had a passion for animal rescue, bringing home stray or abandoned animals in need. Teresa, her husband, and son share their home with Woody, her new rescue kitten, and Gibson, an AC PAW chihuahua mix. Welcome Dot! 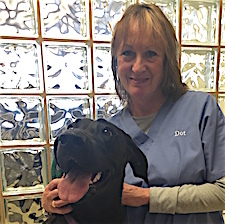 After working for years with the airline industry in customer service Dot retired and move to the great state of Montana where she worked seven years as a veterinary assistant and receptionist. Her recent traveling adventure has brought her to the spectacular Traverse City area where Dot, her husband, and dog enjoy hiking and sight-seeing. Of all her life traveling she has a special affinity for the continent of Africa, its wildlife and beauty. When she’s not on the road, Dot enjoys music, handicrafts, and cooking! Britney has made a career of working with animals. As a teenager, she spent summers on her family’s farms and volunteered with wildlife rehabilitation. After studying fish science at Virginia Tech she worked with exotic companion animals and started her own dog training business. 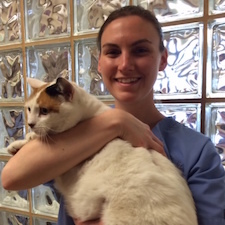 Britney spent the bulk of her life in the South as her father traveled from place to place in the Marine Corps, but has recently moved back to her hometown of Traverse City and began the next step of her journey in a veterinary setting. 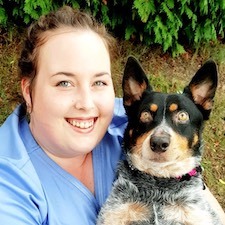 Along with her sidekick, a fun-loving Blue Heeler named Calypso, Britney enjoys hiking, cooking, reading, painting, and touring the occasional local vineyard. Welcome Shelli! Shelli is from Sutton’s Bay, she and her husband moved back to Michigan after he retired from the Army. They have one son, Adam, who is their life❤️ She has four rescue dogs and seven rescue cats and a bird  Shelli and her husband have found our little piece of heaven with their critters in the Kingsley countryside where they plan to retire. Shelli loves gardening, biking, kayaking, camping, antiques and her job!! !